I am super excited to share this card. It features a fun galaxy style alcohol ink background, a slider countdown channel and two wobbler elements. What could be more fun than that? What a super fun card for a young child who loves this type of thing. The My Favorite Things stamp set I used today has some flexibility to make something other than a birthday card should you choose with a different sentiment. I created a video tutorial for this card that focuses on how to build the interactive card. The coloring is not part of the video, so I'll share some information on how I did the background. 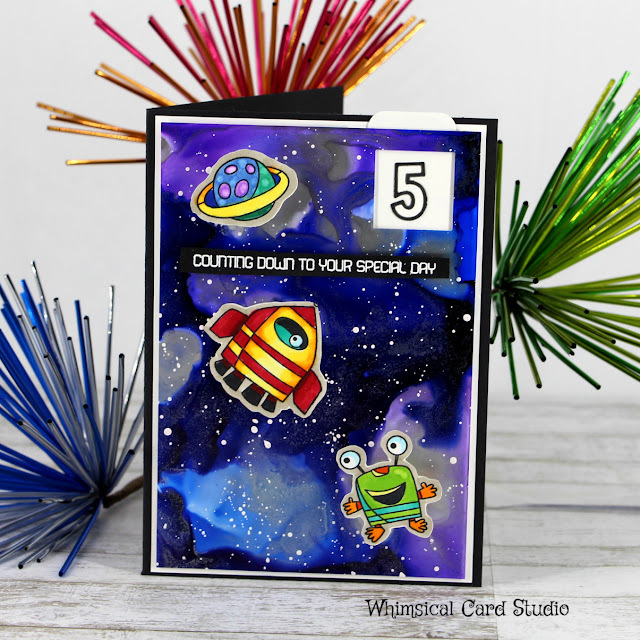 The stamped and die cut space ship, alien and planet were all stamped onto Neenah Solar white 80 lb cardstock with a Copic friendly ink, then colored with various brightly colored alcohol markers - most Copic and a few Spectrum Noir. I didn't keep track of the colors I used this time. The background was created using Yupo alcohol ink paper from Ranger. I dropped several blue and purple colors as well as silver mixative onto the paper, then used a straw to move the colors around until I was happy with the result. After the alcohol inks dried, I wanted to create the look of a galaxy and stars. I used watered down gesso and flicked all over the panel with a paintbrush and allowed it to dry overnight. The colors I used will be listed at the end of this post. (Note: affiliate links are used which don't impact your price at all and if you use them to purchase products seen here, I may earn a small commission - your support is definitely appreciated as it allows me to continue bringing you inspiration, videos and giveaways, like this one. 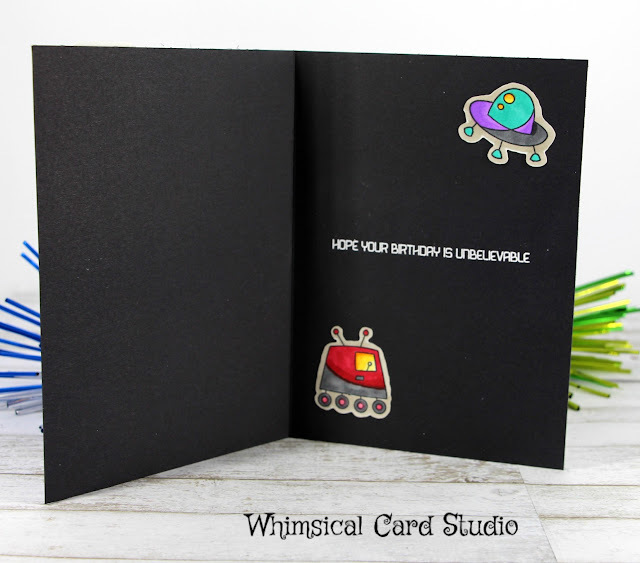 Here's the finished inside of the card, where I used a couple of the other colored die cut pieces and another sentiment reading "hope your birthday is unbelievable". I am also playing along with the Simon Says Stamp Wednesday challenge, which is an "anything goes" style challenge. Since the SSS design team at SSS is using My Favorite Things products, I thought it would be fun to pull out this super cute stamp set called "Out of This World" and the slider channel dies and voila! Sadly I found this particular stamp set is not available anymore- I will link to some similar stamp sets that could be substituted for the one I used. The slider channel builder die set is still available which is very useful for creating this type of card. I appreciate you stopping by today to take a look - if you have any thoughts about this card or technique(s) used, please do leave a comment. I'll always reply to questions and try to reply to all comments as time allows me to! Note: affiliate links are used below for the products I used in this project. If you are inspired by my creations and use these links to purchase something, I may earn a small commission (depending on which store you shop from). this does not impact your cost and helps support my blog, YouTube channel and future giveaways. Complete details may be found on my disclosures page. What a great design, inside and out, Teresa! Thank you for playing with us at the Simon Says Stamp Wednesday challenge!